Chop the herbs finely and mix in the barley flour and salt. Add enough water to bind it together and place in the centre of a linen or muslin cloth. Tie the cloth securely and add to a pot of simmering venison or wild boar (a pork joint will do just as well). Leave in the pot until the meat is cooked and serve with chunks of bread. Reading over the recipe, I realized it was made with wild greens that would have been gathered from the cook’s surroundings. 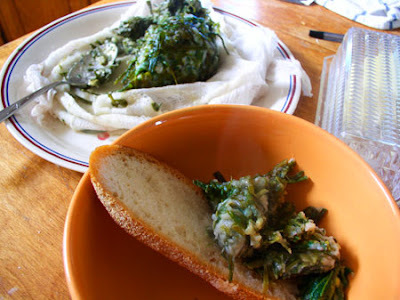 So, even though I live in Queens, I decided to make my recipe with wild greens gathered from *my* surroundings. WARNING! If you don’t know anything about wild plants, you can poison yourself. I grew up in a rural area in a family full of chemists, so I have some background in identifying wild edibles. Don’t try this at home if your only experience involves me, or looking at photos on the internet. 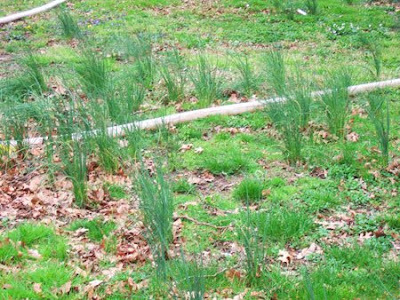 Wild onion sprouts in a housing project. I got the idea to try hunting and gathering in New York after I saw wild onions springing up in the yards of the Ravenswood Housing Projects. The lawns have gone to seed; which was great for me. On a walk home from my boyfriend’s house, I hopped the fence and snipped some of the green onion tops. This lot was also bursting with violets, another edible plant, but one I didn’t think was appropriate for this particular recipe. I tucked the onions into a plastic bag with a damp towel, so they wouldn’t wilt. Next I came across a vacant lot, and found another plant I had been searching for: Lamb’s Quarter. I first learned about lamb’s quarter while working on a video with chef Bill Telepan, who also uses wild leeks and ferns in his cuisine. The lamb’s quarter were just babies, since it’s so early in the season, but they would do. I snipped them and added them to my baggy. I also squeezed through a locked gate to grab a couple handfuls of what I thought was wild yellow sorrel, but after bringing it home I wasn’t sure. I decided to pitch it, and wait until I had more sorrel information. Lastly, I passed by an embankment near the East River and collected some young dandelion leaves. They are best eaten before they flower. While I was foraging, I really expected to be treated like a crazy person. 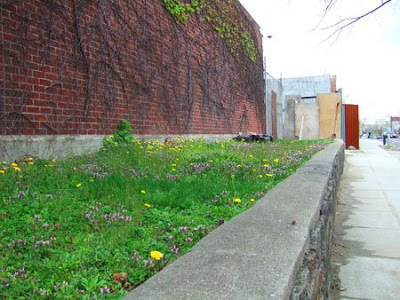 It’s not often you seen some one picking weeds out of a vacant lot in Queens. But strangely–people went out of there way to be nice to me, and say “hello.” I guess carrying a handful of green stuff = good person in the universal judgement book. I brought everything home and washed them thoroughly in a colander. I even used a touch of soup. I sampled a few leaves–the onions were especially flavorful and delicious. The dandelions were bitter, but bearable, and the lamb’s quarter was delicate. I couldn’t find the recipe’s namesake, Nettle, in the wild. So I stopped by the Paffenroth Gardens stall at the Union Square Green Market and picked up a bunch. 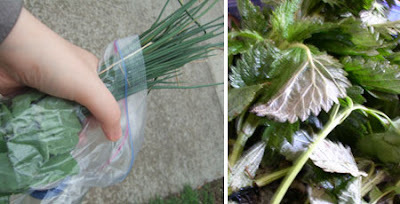 When I got home, I pulled the nettle leaves from the stems (I recommend wearing gloves; they ain’t called stinging nettles for nothing). I then chopped all of my greens finely, and mixed them together. I was not able to find barley flour in the grocery story; I bought barley in hopes of making my own, but it turns out I need a “grain grinder.” So I substituted a cup of regular flour, and added just enough water to make it wet enough to bind together–about 1/2 cup. I formed it into a ball, and wrapped it in cheesecloth, tying off the end with a twist tie. Left: Adding flour and water, and forming into a ball. 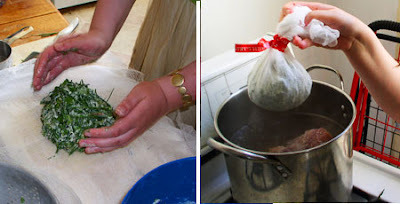 Right: The ball is wrapped in cheesecloth, and dropped into a simmering pot of hot ham water. I had a ham bone in the freezer, left over from Easter, and I threw that in a big pot of water and let it come to a simmer. I dipped in my cheesecloth encased ball, and let it simmer for an hour. An hour later, we had what one of my friends described as a “hammy leafy wheat ball.” I told her to be quiet because she was about to put a time machine in her mouth. When I unwrapped the cheesecloth, the pudding was surprising firm and a deep green. I scooped servings onto slices of bread. The verdict? Not bad. I wouldn’t make it for pleasure, but the taste was surprisingly mild. Any hint of bitterness from the greens was gone, and they were all very tender. The dish was also very filling: my friends and I ate our whole servings, then hiked and played 4-square for 5 hours. And we felt good. 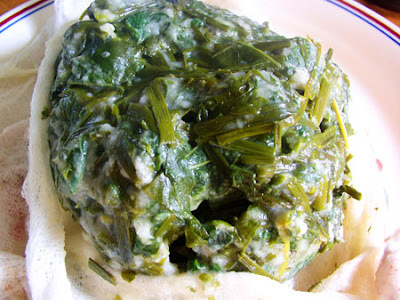 I feel like Nettle Pudding was designed to put to good use spring greens, a food that while very nutritious was not very filling on its own. Barley flour would have added even more nutrients to this dish. The dish was also designed to be eating with meat. The pudding helped a small amount of meat go a long way, much in the same way rice or grits are used as a filler. And I have to say, it was pretty cool to eat something very similar to what people were eating 8,000 years ago. And if you live in New York , take a foraging tour with Wild Man Steve Brill.